I wish I had someone who could just tell me exactly what to do with the data from the kids’ fitness trackers. Part 3 of ‘So You Want to Launch a Kids Fitness Program?’. See part 2 here. Yea, that’s right – your awesome intern or volunteer charged and synced the kids’ fitness trackers to the health technology platform, but now what? Don’t worry, you don’t need to be a statistician to assess their physical activity and see how many moves they are doing. BUT…. for someone with limited Excel experience, this may be TERRIFYING. Relax, you don’t need to do V-lookups or know SQL [us nerds know what that is]. However, trrrust me! It would be great if you knew some basic Excel functions like SUM, COUNT, and AVERAGE. If you can do such functions, you now have the ability to (somewhat) assess the kids’ fitness tracker activity. It’s easier to have some basic knowledge of Excel then just “hope it works out.” With that said, here is how we go about analyzing the kids’ physical activity using the fitness tracker data from our kids’ health program. First, what do we want to do with the data we are tracking? 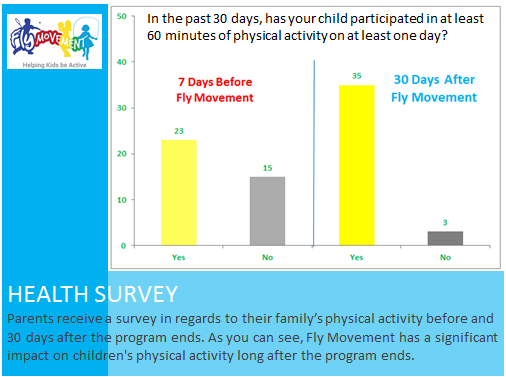 We want to accurately assess the physical activity (moves) the kids are generating during Fly Movement’s six-week program along with comparing pre- versus post health surveys which are distributed to parents. In addition, during a Fly Movement program, we want to notify school administrators and parents about the progress of our program. Pre/Post survey – what’s that? 30 days after the program is completed, the same survey is sent to parents. After the post survey results have been retrieved, the results are compared to determine if the kids along with their families are more physically active. And THAT, my friends, is one way we determine if our program has long term positive effects. Here is an example of the pre-versus post survey results from one program we implemented. As you can see from the post survey results on the right side of the graph, Fly Movement has a significant impact on children’s physical activity long after the program ends. Analyzing kids pre vs post fitness survey. Now to the hard data. Since we provide the kids participating in our program fitness trackers, we are able to track the number of moves each kid generates during the course of our program. As you know, the trackers are synced once a week by a Fly Movement intern or volunteer. Typically, if the kids are without their trackers for several hours the day their trackers are being synced, we do not include that day the trackers were synced. For example, if our intern is visiting the kids on Wednesdays to charge and sync the fitness trackers and retrieves the trackers at 9am, but doesn’t return the trackers until 2pm, we do not include that Wednesday in our data since the data will skew less as the trackers would have been in her possession for a long period of time. However, if the trackers were synced and returned in two hours or less, then we would go ahead and include that day in our kids fitness data assessment. Where do we get/download the fitness data? If you are using the DHS HealthSpective platform and have already setup your group/sub groups and tied each tracker to a specific student, then under the Admin Center on the top right, you would select the appropriate sub group(s) you will be analyzing. For example, in Fall of 2017 we named one of our sub groups (one classroom) “Brookline_Roberts_Sep-17” where ‘Brookline’ is the name of the school, ‘Roberts’ is the name of the teacher, and ‘Sep-17’ is the month and year the program began for this classroom. While groups have been assigned to the kids in a classroom, it’s best to NOT simply look at the activity as a whole for that group. Meaning, there may be students/trackers with no activity or very little movement. So, if you were trying to assess the average moves or miles per student in a classroom, you should sum the total moves or miles and divide them by only the trackers that had activity. Example: In the report below that was pulled for ‘Brookline_Roberts_Sep-17’ from 9/27 – 10/3, there are several students missing data. (Some kids may not have brought in their trackers that day the trackers were being synced). In addition, there are a few students who have very low volumes of moves (Keith, Victoria, Julien, and Extra Tracker -1). So, we would consider these as outliers and remove them from our moves calculations. Get the total number of days by subtracting 10/3 – 9/27 (6) *Note, if the students are without their tracker for several hours the day the trackers are being synced or charged, then you might want to consider using (6) as the total number of days. But if they are without the trackers for just an hour or two, go ahead an use (7) as the total number of days. After the data has been calculated, we would repeat the same calculations for the other class(es) participating in the program. From there, we can create various charts showing the kids activity by week and their progress. 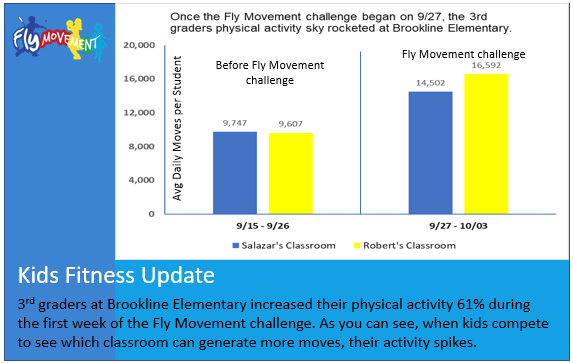 In the example below, before the Fly Movement challenge was given, both classrooms (Salazar and Roberts) averaged around 9,600 moves per day per student from 9/15 – 9/26. Once the challenge begun (both classrooms competing to see which could score more moves), their activity / average daily moves jumped to around 15,000 moves a day. BOOM! Over the next five weeks, such information would be used in our newsletters, websites, social media channels, and flyers to communicate the success of our program to parents and school administrators. To create the fancy chart above, its just a matter of playing with powerpoint and excel charts. What, I have to know how to use powerpoint too? I know you’re hating me right now; I can feel it. See Part 1 – So You Want to Launch a Kids Fitness Program? Read This First. You can also support Fly Movement by shopping at Amazon. 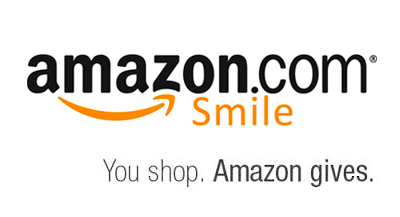 When you shop at smile.amazon.com, Amazon will donate 0.5% of the price to Fly Movement. Shop at Amazon and Amazon will donate a portion of the purchase price to Fly Movement.